Robert Mueller has picked up another trail to find a charge that will justify impeaching President Trump. It is still the Russian collusion angle, but this time with potential (Mueller’s fingers are crossed) financial wrongdoing to boot. Mueller has questioned several witnesses about known contributors to the Trump Inaugural Fund. Apparently, he is trying to tie President Trump to Viktor Vekselberg, a Russian billionaire, whose company donated to President Trump’s inauguration, which is perfectly legal. It is the fact that he is a Russian national that appears to be the connection that Meuller is trying to make. Vekselberg’s cousin, Andrew Intrater, is also a person of interest in Mueller’s new probe. He donated to the president’s inauguration fund, as well. Intrater is an American citizen. Another American of Russian (Ukrainian) descent who donated to President Trump’s inauguration fund is Leonard Blavatnik. He is only Russian (Ukrainian) by birth. He is an American and British citizen. So, with all we know about Hillary’s foreign contributors, not to her inauguration, which never occurred, but to her campaign (ILLEGAL as hell! 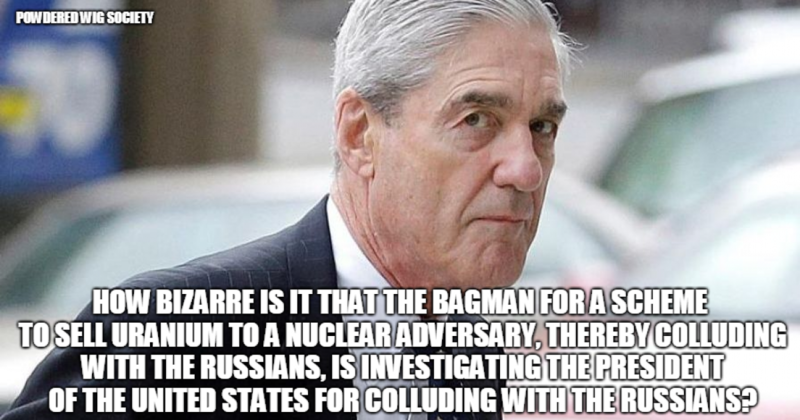 ), how is it that Mueller, himself a player in the Uranium One scandal (he was the bagman who personally flew a Uranium sample to Moscow, where he delivered it to the Russians on the tarmac) is still chasing this wild goose? Mueller is like a beat cop who witnesses a double homicide in front of a convenience store but ignores it to continue watching a suspected shoplifter who takes his merchandise to the counter, pays for it and walks out of the store, where Mueller stops him, strip searches him, then strip searches everyone in the car he came to the store in, looking for a candy bar. Special counsel Robert Mueller is investigating foreign donations to President Donald Trump’s inaugural committee, according to a new report. Mueller’s investigators have questioned several witnesses about millions of dollars in contributions from donors with links to Qatar, the United Arab Emirates, Saudi Arabia and Russia, according to ABC News. One of the people interviewed is Thomas Barrack, a longtime Trump friend who handled financing for the president’s inaugural committee. Barrack, a billionaire real estate investor, pulled in more than $100 million for the inauguration, ABC News reported. That was more than double what was raised for former President Obama’s inauguration in 2009. Witnesses have been asked about Andrew Intrater, the chairman of Columbus Nova, the company revealed on May 8 to have paid longtime Trump lawyer Michael Cohen nearly $500,000 in the months after Trump’s inauguration. Intrater is the cousin of Viktor Vekselberg, a Russian billionaire who was recently sanctioned by the U.S. Treasury Department. Mueller’s team interviewed Intrater and Vekselberg within the past two months. Intrater contributed $250,000 to Trump’s swearing-in event, which both he and Vekselberg attended. Mueller may as well interrogate Bullwinkle for his connection to Boris Badenov. This entire frame job, masquerading as a legitimate investigation, is now beyond preposterous!